World Tour, in celebration of their latest Nike sneaker, the requests for clash dates inundated the Irish and Chin office. Anxious to "warr" again, Mighty Crown accepted some clashes, along with a number of juggling dates. Notably, Mighty Crown's recent Holiday set of performances on the tour yielded two wins (in Canada and Atlanta) and a landmark juggling set in New York. In Canada, Mighty Crown took on the likes of Roots Man and Lexxus Supreme in the heavily-promoted "Three the Hard Way" clash. Mighty Crown proved themselves ever-so-capable against their competitors, despite some time out of the clash arena. As a cushion between the two clashes on the line-up, Mighty Crown breezed through New York and left a lasting impression on dancehall fans when they sold-out Steelie Bashment's annual fete. There, Crown juggled hard, causing the swollen audience to rock to their heavy dancehall set. Mighty Crown continued their momentum on Thanksgiving night in Atlanta when they faced off against popular African sound Shashamane. 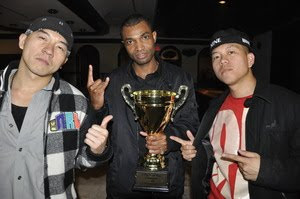 Mighty Crown's Dynasty World Tour kicked off in October 2009. The tour has been doing well as it has featured Mighty Crown in their sharpest form. Of course, Crown's Nike sneaker was a hit -- selling out quickly in every venue and online. The limited edition kicks are now a collector's item. Recently, Mighty Crown has eyed competing against big local sounds. This choice is not without merit. "I like the concept of Mighty Crown clashing with local sounds, as it helps introduce Mighty Crown to the next generation of clash fans," says Crown's manager Garfield "Chin" Bourne of Irish and Chin. "Many top local sounds have strong fan bases of young people....I want Crown to appeal to them." Mighty Crown still has tour dates lined up in Europe later this month and in February 2010. Meanwhile, March/April 2010 will land Mighty Crown in the Caribbean and select cities in the U.S. Stay logged onto http://www.irisandchin.com for details.